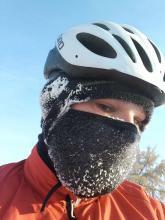 Winter Strategy: Thoughts after six years of bicycling in the winter. Peaceful riding in the winter, with no cars in sight. Korey joins me for some winter riding. All but the balaclava, back when I wore glasses. No snow pants either. Must not have been cold enough. First, a few words about safety. I've been a cyclist in Idaho for nearly seven years now, of which six I've ridden most days through the winter (including this year). Despite intuitions to the contrary, cycling in the winter is nearly as practical as it is through spring, summer and fall. This is not to say care may be thrown to the winds, but with proper gear and strategy, you can ride your bike most days of the year with little hassle. Studded snow tires are very effective at keeping traction most of the time, and key winter clothing combinations will keep you comfortable. That being said, there are conditions and situations where you are better off not riding. Knowing what your limits are and when to find another way to get to your destination takes time to figure out. It's better to chicken out than risk your safety, even if you could have ridden that day. Have a backup plan. More than anything, I think this is important. For those without cars, consider walking, if you can. Do you know your bus schedule? Have friends you can carpool with? Tuck some cab fare away. There are winters I've ridden nearly every day, and winters I've taken the bus for a couple of weeks. The biggest risk factor is, in my opinion, your route. The roads are narrower in the winter and more hazardous for everyone -- especially cyclists and pedestrians, since we lack a protective shell and must share the road with multi-ton vehicles. The shoulder or bike lane we become accustomed to riding in can have snow plowed into a heap, or with churned snow/ice that makes staying upright a focused and difficult objective. If your route is busy, the roads are narrow and you have concerns about staying upright, switch routes or switch modes of transportation. If, on the other hand, you commute mainly on residential streets with a car or two behind you now and again, you don't have nearly as much to worry about. On these streets, you can take the lane and focus on your riding, not the cars around you. When the cars are gone, riding in the winter can be a real joy. Some days the snow and ice can make this tough, too, but on average, most snow and ice is manageable with quality studded tires. 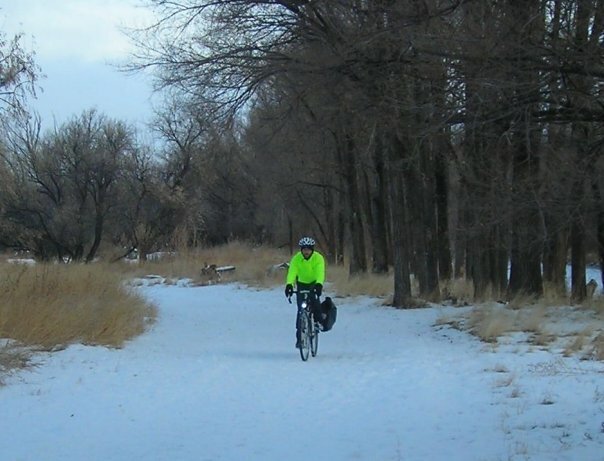 Believe it or not, it's not all that difficult to stay warm riding in the winter. The novice winter cyclist will usually wind up overdressing, generating way too much heat mid-way through the ride. In the worst case scenario, overdressing can cause you to sweat too much and chill you. Clothing choices must be tailored to the individual, but here are some rough guidelines that work for me. 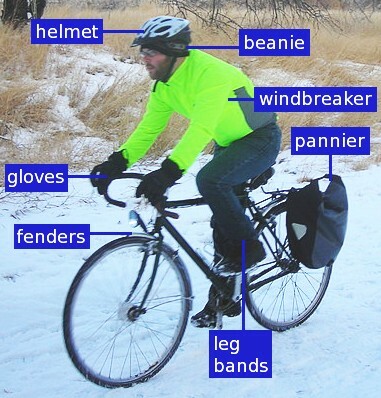 Above 32F: Long sleeve merino wool shirt, light windbreaker, light gloves, most kinds of footwear, pants, and a beanie under the helmet. Below 25F: Consider pulling balaclava up over face and nose. Harder to breath, but keeps the face toasty warm with your breath. Boots more imminent, with heavy wool socks. Below 20F: Snow overpants, balaclava covering face, thick wool socks with boots. Everything else down to 0F: Add layers as necessary. You may consider ski goggles, though I've never used them. 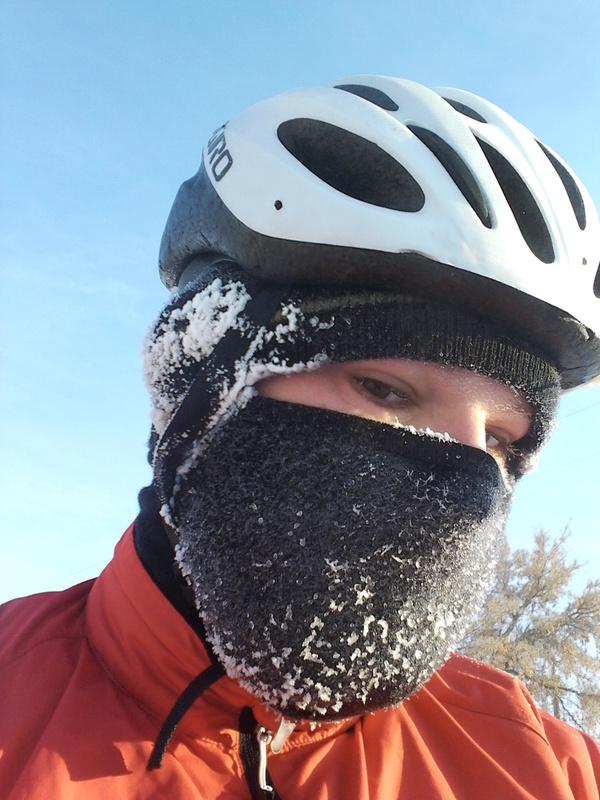 I've never ridden much below 0F, but the above is my usual strategy. Dress so that you're slightly cool when you step out the door, because you'll warm up a lot on the way. Again, individuals vary, and you need to play it by ear. Cotton is discouraged, especially in very low temperatures, because it retains moisture and gets cold when wet -- if your shirt soaks up your sweat and then freezes, it can make you cold very quickly. In town this is generally not as worrying, but can be outright dangerous in an emergency. Synthetics and wool, particularly those made for outdoor activity in winter weather, are recommended, though I've used cotton myself in the past (on trips no longer than four miles or so.) Merino wool is my preferred base layer. Consider keeping backup gear (gloves/balaclava/beanie) in a pannier; it's possible for them to get wet and not dry off by the time you need to use them again. I consider the balaclava to be essential below a certain temperature. The cold can be downright painful on your face when it's significantly below freezing. For this reason, I always keep one tucked away in my windbreaker's rear pocket. A balaclava pulled above the nose works nicely -- your breath gets trapped and keeps your face plenty warm. However, if you wear glasses, this can be hazardous. Your glasses will likely fog over, making it difficult to see. When it gets really cold, this fog can freeze! Now you're blind. An anti-fog solution is essential. Buy an anti-fog product, or try a thin film of dish soap on your lenses (really, it works.) I used the latter technique until switching to contact lenses. If you can wear contacts, I would recommend them above all. My first recommendation for anyone considering riding in snowy/icy conditions is to invest in some quality studded snow tires. These can be pricey, but they're worth every penny, in my opinion. I've been riding with Schwalbe Marathon Winter snow tires for four winters or so (different brand before that), and I can't think of a time I've ever had a close call with ice or snow while using them. Slush, and what I call chocolate mousse, is another story. More on that later. The Marathon Winters pack 240 tungsten carbide studs per tire, which don't slow you down nearly as much as you'd think they would. Tungsten carbide studs are generally recommended because they'll last much longer -- steel studs will lose their effectiveness much more quickly, so you'll be replacing the tires (or studs) more frequently. A Schwalbe Marathon Winter tire -- 240 studs on each, and I wouldn't go without them. Remember, the studs are for ice, the knobs are for snow -- you need a combination of both on the same tire, which is typical. You should still exercise caution with studded tires, especially since there are so many different kinds of ice and snow, but your odds of falling will be greatly reduced; what might have brought you down before can turn into a skid instead. Your margin for error is increased. Consider dropping your tire pressure as low as you can without risking a pinch flat or damage to your rims. I usually ride 40psi or so. This can really, really help with significant snowfall, and should improve your traction overall, although it's possible to cut through fresh snow with higher pressures. Secondly, it's necessary to develop a recognition of the nuances of winter road conditions. Fresh snow is almost always easier to ride in than churned snow, or frozen tire tracks. After a first snowfall, the shoulder of a road can be nearly untouched and perfectly rideable. Once it's been churned, frozen and refrozen, etc, it becomes a hazard, and it will toss you around, increasing the odds of falling or veering off course. This is most concerning if you're trying to share the road. My recommendation? Don't ride in this stuff. If the road itself is 99% bare, if cars can pass you safely and you're highly visible, ride on the bare pavement, as close as you safely can to the right. Be careful here, because the frozen edge can cause sudden traction problems. This might mean riding just outside the white line. If you get caught between a rock and a hard place and have no other options, you may need to take the lane (if it's safe) and ride where you have plenty of traction. This stresses me out, and frankly, I'd rather not be in that situation, but it sometimes happens, even in the summer. If you have the option, just stick to residential streets and routes where riding on the shoulder is unnecessary. The brown/black mess of churned snow produced by motor vehicle traffic, referred to earlier as chocolate mousse, should be avoided at all costs, and caution used if it otherwise can't be avoided. Hard snow pack and the usual types of ice are generally a non-issue, although I've seen roads a time or two that have looked like a solid sheet of ice that I wouldn't chance. Again, it takes time to figure out what's okay and what should be avoided, and caution should especially be exercised if you're uncertain. One close call I had in the winter happened not from ice and snow, but from heavy slush. We had gotten a significant amount of fresh snow that was being melted rapidly by higher temperatures, and I almost went down trying to navigate through it (fortunately on an empty street). If I recall, I was able to catch myself with my foot, but it was not a pleasant experience. Very heavy snow can be a complete non-starter with any bike I have experience with. Moderately heavy snow can toss you around and make you feel like you're going to fall any moment, but can indeed be navigated with a bit of handling skill and low pressure tires. I only recommend this if there are no cars around -- say, on a vacant bike path. Falling over in the snow at low speed when you're bundled up and insulated is not usually a huge deal, but falling into traffic can be fatal. In these situations falling happens much less than you'd expect, but the probability is much greater. On my current route, I'll often wait for the roads to clear up before I even consider riding. You should try to pilot your steed in as straight a line as possible over slick surfaces, go slow when you're uncertain, and apply power to the pedals cautiously. Gravitate to the surface area with the most traction. Be extremely careful with your front brake on slick surfaces, and avoid sharp turns at all costs. When the road is covered with fresh snow, be mindful of what may lie beneath it. Manhole covers, train tracks, etc. If your tires are narrow enough to get caught in a railroad track carved into the road, you can be brought down rather quickly. This is actually one of the only times I've ever fallen in winter due to road conditions, on a vacant street I was unfamiliar with. 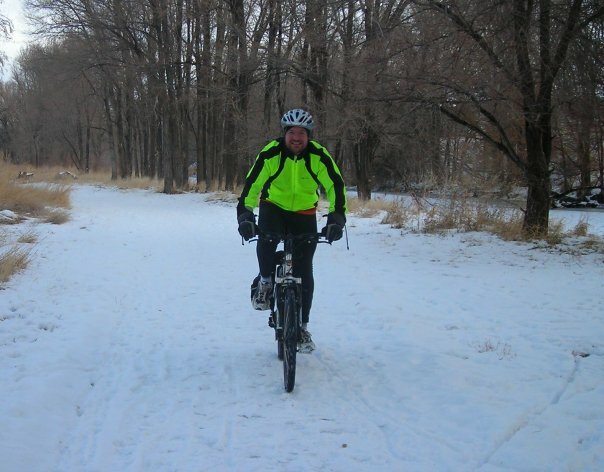 Another time I was riding without snow tires over a slick wooden bridge on a bike path and overestimated traction. Again, no car in sight. The next one almost doesn't count: I was climbing a hill recreationally in February after all of the ice and snow had been melted. The heat generated fogged my glasses and I lost sight of the edge of the road. My tire went off into the mud and I slipped. Finally, and what most people seem to forget: the roads are clear or mostly clear the majority of the season, and staying warm is the most you have to worry about. I've tried to be exhaustive with this section, giving the reader fair warning, but many days are downright mundane. Riding in the winter becomes a routine. Disc brakes work best in wet conditions, so use those if you have them. Rim brakes can have their effectiveness greatly reduced and caution should be used. Pulling down on the levers can clear snow off and get you stopped, eventually. I've only used rim brakes in the winter for one season, so I don't have much more advice than that. Switch if you can. My winter bike is a fixed gear, meaning there is a single gear with no freewheel/coasting ability. I can slow the bike to a stop by resisting the pedals, which has been my preferred method in winter to this point. Snow usually slows me down, so I tend to slow to a stop most of the time. This bike is equipped with rim brakes, but I rarely use them in the winter. Derailleurs can freeze up in the cold. Sometimes shifting just doesn't work. This is partially why I ride a fixed gear in the winter. I don't think this affects bikes with internally-geared hubs. I generally just use grippy, flat pedals with no retention. Winter boots designed for clipless retention systems exist, but they are much more expensive than a regular pair. Being clipped in can also give you less time to react if you need to put your foot down. Be sure your boots will comfortably fit a layer of thick, wool socks or two. Mine are a little big for this reason. It gets darker come winter, so being seen (and seeing the road) is more difficult. I recommend a high quality lighting system and reflective clothing. My lighting setup uses a generator hub, so there are no batteries (which can have trouble in the cold), and my LED headlight is as good for seeing the road as it is to be seen. Generator hub setups are expensive and not required, but I would recommend the best lighting setup you are willing to purchase. If possible, do some research and build yourself a winter bike. The wet/sloppy conditions can be very harsh on your drivetrain, especially if salt is used on the roads. If you're using your best bike in the winter, consider frequent drivetrain maintenance. Get some long fenders if they'll fit -- they'll keep both you and your bike cleaner than you'd otherwise be. Having two bikes is nice, too, in that you can ride your regular bike just until the point you need the studded, winter bike, which will be immediately available and ready to go. Ease into the season. Just keep riding every day and adjust your clothing as necessary. I generally install the studded tires on my winter bike around December, or when the forecast shows signs of snow. Practice riding in winter conditions where it's safe to do so. Learn your limits. Get used to checking the weather before you head out and throughout the day. This can inform how to dress, and how safe/practical it is. Your morning commute may be fine, but a blizzard can prevent safe return home. My strategy here is to take the bus when conditions change, usually bringing my bike home with me on the bus rack. Chicken out. Really. It's okay to take a break when the conditions are hazardous, or you just don't feel up to it. Keep cab/bus fare on hand, and use it when you need to. There are days I've been on the road with some regret in retrospect. When in doubt, don't pull the bike out. Study the map and find the least trafficked route you possibly can. This might mean considering routes you'd never think of using in the summer. When there are no cars to worry about, most of the danger goes away. Consider a helmet mirror. I like mine a lot. Remember, winter conditions vary. Snow and ice melts, the roads clear up, and it stays that way for a while. Things usually get interesting in December, January tends to be the coldest month (thus more likely to keep snow and ice around), and by the end of February I don't worry about the roads or the temperature as much. I highly recommend researching this topic further. Below are a few links to help you out. While lengthy, this article is by no means exhaustive.